More PR Value for Your Dollar. Guaranteed. Free Press Release Distribution Tips. 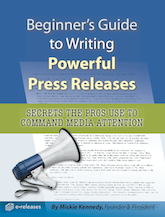 Send your press release to journalists who want it! Reach all major news outlets through the largest newswire service for press releases. Connect with industry-specific trade magazines, reporters, and bloggers. For 20 years, we have nurtured relationships with journalists, reporters, and bloggers. We succeed by hand-selecting the journalists most likely to respond to your news release distribution. Unlike other press release distribution services, we haven’t forgotten the power of print, radio, and television. A detailed report shows traffic, audience, and engagement, as well as your media release distribution on as many as 300 online pr media submission sites. Make a name for yourself. Boost sales. Call 800-710-5535. Thank you dear friends for your efforts. thanks to you getting the press release out. It’s really great for us! Actually the press release worked really well. It created a busy day… Good problem to have. Phones rang a lot this morning. Because of the release, I think Jim may be doing an interview with a pretty big radio station, so we are extremely happy with the results. My experience with eReleases was ABSOLUTELY AWESOME! After about a week, I am still amazed at the amount of exposure I received from your company. Needless to say, eReleases has a new regular. I’m pretty pleased with the surprise. Buzz Builder™ distribution for just $199, a savings of $100. Quantity discounts as low as $179 per release. 75+ online pr media sites guaranteed. Press release writing service – only $200. Save vs. standard eReleases pricing. New customers only! Grab my book FREE - now!